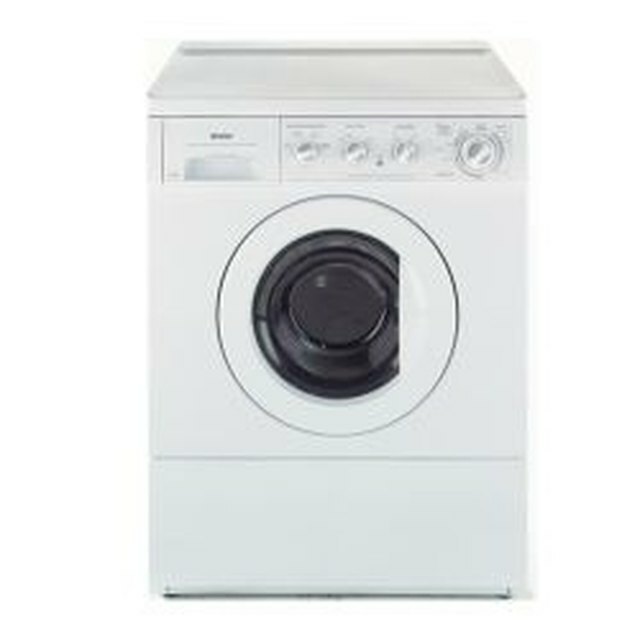 The Maytag Performa washing machine is a reliable appliance. Sometimes, however, parts wear out and need to be replaced. The belt on the washer is no exception. Knowing how to easily replace a belt on a Maytag Performa will allow the do-it-yourself homeowner to repair his own washer. Disconnect the power supply to the Maytag Performa by unplugging it from the wall outlet. Shut off the water supply by turning it off at the wall station. Place a bucket underneath the connection of the water hoses to the washer. Use pliers to twist the water hose connections counterclockwise and remove them from the washer. Place the ends of the hoses inside the bucket to catch any residual water. Use a screwdriver to remove the eight hex head screws that attach the rear panel to the washer. Set the rear panel away from the work area. Locate the water pump for the Maytag Performa. It is near the right rear corner of the washer base, and it is easily recognized by the two water hoses attached to it. Use a pair of pliers to compress the hose clamps that attach the hoses to the water pump. Remove the three screws that hold the water pump to the base with a screwdriver. Slide the pump forward to disengage the belt. Remove the belt from the Maytag Performa. Install the belt on the Maytag Performa by looping it over the motor pulley and stationary pulley. Insert the belt on the water pump pulley, and pull the water pump toward you. Hold tension on the belt with one hand while securing the water pump to the base using the attaching screws. Reconnect the hoses to the water pump, and secure them to the pump with the hose clamps. Position the rear panel back on the Maytag Performa, and reattach it with the eight securing screws. Reconnect the water hoses to the rear of the washer by threading them clockwise. Turn the water supply back on to the washer. Reconnect the power supply by plugging the washer back into the wall socket. Always disconnect the power supply before servicing appliances.